Sick and elderly Bosniak woman attacked again by notorious Serb police officer in Konjevic Polje, village just outside of Srebrenica. PHOTO: Elderly Fata Orlovic was transported to hospital after notorious Serb police officer Ranko Uzelac trespassed on her private property and slashed her hand with a knife. 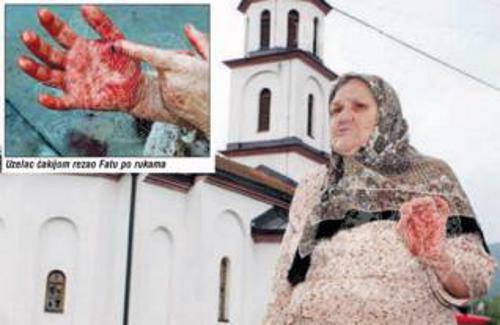 Fata Orlovic is an elderly Bosniak woman, a returnee to Konjevic Polje and a survivor of the Srebrenica genocide. During the war, Serbs confiscated her private property by illegally building a Serbian Orthodox Church in her front-yard. For a long time, she has been regularly harassed, threatened, and demeaned by local Christian extremists who called her names, threatened to kill her, and even spit at her. On several occasions, she was beaten up by a local Serb Police officer, Zdravko Uzelac, a known criminal who participated in the 1995 genocide. In 2007, the courts ruled in Fata's favor and ordered local Serb authorities to "move" the Church somewhere else. Serbs never complied with the court order. Bosniakophobia, the hatred and prejudice against the Bosniak people in this region, is running very high in the Drina valley. Serbs still feel 'betrayed' because of western presence in Srebrenica, which prevented them to fully exterminate Bosniak people in this region. 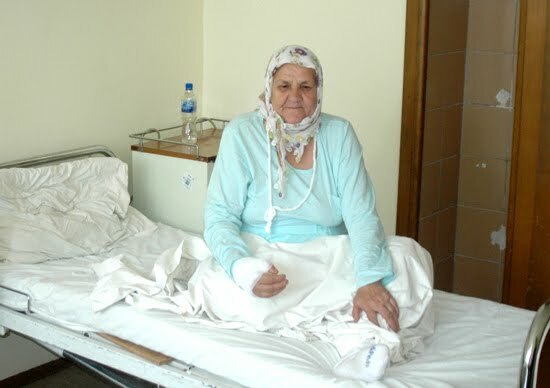 The ailing and elderly Fata Orlovic was attacked again on 10 September 2010, the day when Muslims worldwide celebrated the end of Ramadan. Serbian Orthodox priest from Bratunac - Borislav Todić - came on Fata's private property with a group of local Serbs. When she asked them to leave, notorious police officer Ranko Uzelac started swearing and calling her demeaning names, insulting Islam, and telling her he would kill her if she continued to interrupt their Church services. She reminded him that the courts ruled in her favor and they have no right to enter her private property. She told them they must honor the court ruling and move the Church somewhere else. Uzelac continued swearing and then he pulled a knife threatening to kill her. The elderly woman took a brick to defend herself, but the attacker slashed her hands with a knife as she was defending herself. Fata was transported to Tuzla's cantonal hospital, while Uzelac filed new criminal charges against this elderly woman. He filed charges against Fata at least 2 times in the past, but each time the courts ruled in Fata's favor. It's time for this abuse to end. If the Bosnian authorities can't do nothing to put Ranko Uzelac behind bars, then the Office of the High Representative should at least do something to re-examine Ranko Uzelac's behavior and to "move" this extremist Church from Fata Orlovic's private property. Who is Ranko Uzelac, aka Zdravko Uzelac? In the 1995 Srebrenica genocide, Ranko "Zdravko" Uzelac participated in the separation of men who were to be massacred and dumped into mass graves. At least 8,372 men were summarily executed and dumped into mass graves, while 30,000 people were forcibly deported in a mass scale ethnic cleansing. In 2008, Uzelac murdered Mustafa Becirovic, a Bosniak returnee to Konjevic Polje. As a Police Officer, he enjoys protection from radical Bosnian Serb authorities and a high degree of respect from local Serbs around Srebrenica who participated in killings of more than 3,000 Bosniaks in the first three months of the Bosnian war, three years before the Srebrenica genocide, and other crimes which ultimately ended in the July of 1995 genocide. 1. Bosnia-Herzegovina's Federal TV (FTV), includes video clip. 2. Dnevni Avaz, "Napadnuta Fata Orlović: Policajac Uzelac isjekao staricu po rukama i prijetio joj da će je ubiti!" 3. Oslobodjenje, a very brief report about the attack with a promise of more details in tomorrow's edition of the papers. 4. Radio Slobodna Evropa, Jelko Kacin - European Parliament's human rights reporteur - sharply condemned continued attacks against Fata Orlovic.